Simple Obedience Can Turn an Ordinary Day Into an Extraordinary Experience | amen and ehmen! Writer’s Note: I believe that God loves to show up and show out in the lives of His children. Sometimes it’s in a really big and dramatic way and sometimes it’s in a quiet, subtle way, a little wink from the Creator Himself. I’ve experienced both as I have learned to listen for His voice and both are undeniably exciting. The following is a page from my personal “God Journals” documenting what happened on an ordinary day when I slowed down long enough to listen. Enjoy! There was a time in my life–in fact, for probably most of my life–that I would pretty much tune out when someone claimed to hear the voice of God. I actually remember thinking how crazy one must be to really think that God would talk to a mere human. Until, that is, I started hearing the voice of God for myself. Now, while it is true that some people sometimes hear an audible voice, I must admit that I have not to this point in my life. For me, it’s more of a knowing deep in my spirit, that beautiful, still small voice as described in scripture. Why a still small voice, I have wondered. Why does our Big God not have a big boo ming voice? The answer, I think, is that He does have a booming voice, but He only uses it when He really needs it. He prefers to use His “inside” voice, the one that is reserved for those that are the closest to Him. Do you remember how Christ often took the disciples away from the busyness and noisy world, such as when he took them to the upper room for the Last Supper? I believe that it is God’s desire that we retreat with him into the inner room, away from all the noise so that he can commune and talk with just us. You see, we live in a very loud world, a world that is filled with bustling busy-work; a world plagued by noisy battles. But, in the “inner room” all of those noises are muted and God’s voice permeates our heart and soul and, if we are paying attention, we just “know.” The key is paying attention and learning to recognize those sweet, sweet moments. In fact, it is my hope and prayer, that next time you have one of those moments where you feel God is prompting you; where you think you hear His voice, don’t doubt it. If a scripture address crosses your mind while praying to God, stop what you are doing and look it up. God has answered so many questions and enlightened me in this manner so many times in recent years. And, trust me, it never gets old. If you feel God is prompting you to do something and that something does not defy scripture, do it! This, too, has happened to me many times in the last few years with some crazy and amazing results that have left myself and others in awe. Things that seemed small, when done in obedience, turned out to be quite profound, awe-inspiring and, quite frankly, potentially life-changing for those involved. One such experience happened to me on a recent Sunday afternoon. After church, I went on my usual Taco Bell lunch run. As I enjoyed a quick bite in my car, I made a mental note of my schedule for the rest of the day. It was going to be a tight one as I had many things to do before being due back at Church for the new Sunday evening services. First, I had to go to the bank, then the pharmacy, the grocery store and back home to do a few chores before returning to church. The more I thought about it, the quicker I chewed. I had to get going if I was going to fulfill all on my schedule. I finished my lunch quickly and, began planning how I might bypass the crazy Watson Boulevard traffic. I chose the back roads, a much-less traveled alternative which not only runs behind all the businesses along Watson, but that would also allow me to cut through the parking lot of the local Goodwill Store, catch a light and shoot across to my first stop—the bank. As I turned into the Goodwill parking lot, however, I felt the urging to stop. It was strong enough, that despite my busy, self-set schedule, I pulled into a parking spot and began questioning why. I then felt led to go inside. Now, I must confess that at this point, I began protesting a bit in my mind as this was not on my schedule. But, then, I decided that it made more sense to just be obedient. After all, had God not showed me over and over how much better his ways are over my own? What if there was someone inside that needed me? So into the store I walked, and pausing for a moment in the center of the building, I felt drawn to the book section. Ahhh, the book section, I thought. 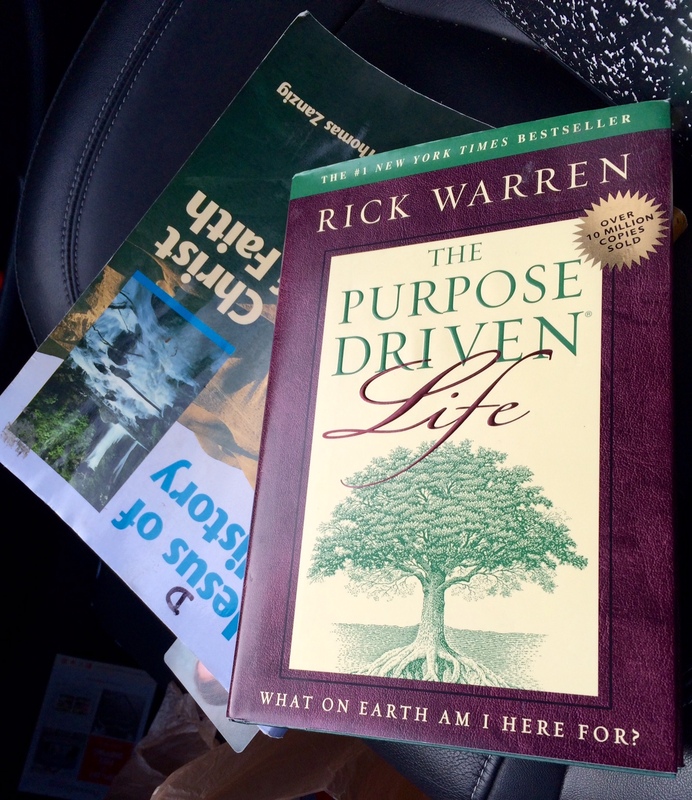 God had been prompting me over the course of several weeks to get a copy of the Purpose Driven Life by Rick Warren for a co-worker, but I just never seemed to have time. Several times over those weeks, as recently as the day before, I had intended to go by the Christian Bookstore, but something always seemed to come up. Supposing that this just might be what this was about, I stood in the middle of a very long isle flanked with book shelves, four levels high and filled with books in no particular order. 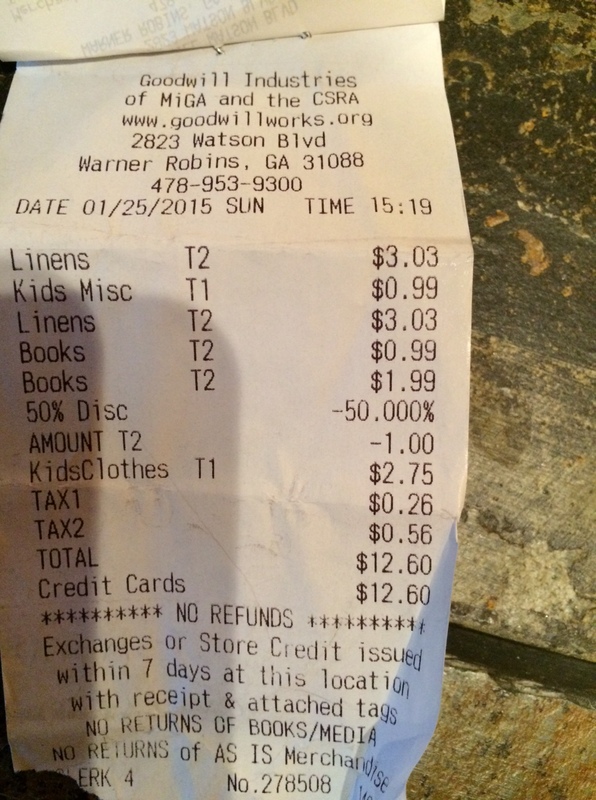 There had to be 1,000+ books there, if there was one. Hmmmm, ok, this must be it! I smiled and I reached down to pick the book up, but just as I touched its corner, my eye was drawn to the book on the shelf right behind it. Yes! You guessed it. Right there tucked so far back that I never would have seen it had I not bent down was The Purpose Driven Life! Man oh man, how I love God! Needless to say, I bought both books and the Purpose Driven Life is now in the hands of the one for whom God had intended it. And, the best news is that we are both better for the experience. Experiences such as this encourages me to listen more and keep being obedient, no matter how small or inconvenient the instruction may be. And, well, the story also seemed to capture my co-workers attention as well. You see, she had just a few days before asked me to pray that God would show us her purpose. I have no idea exactly what will come from this, but I KNOW that, even though this may seem small, it is playing a BIG part in God’s plan. The purpose He has for her is beginning to unfold before our very eyes and it’s unbelievably exciting. I can’t wait to see where it goes and to share more with you. In the meantime, just know this, God is so very good all the time! Listen and obey. I promise that it’s worth it, every time! Amen and Ehmen!